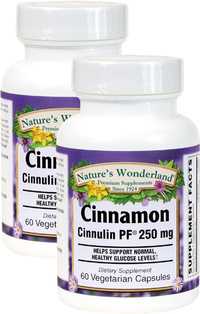 Cinnamon Cinnulin PF® Extract - 250 mg, 60 Vegetarian Capsules each (Nature's Wonderland) - Penn Herb Co. Ltd.
Cinnulin PF® premium cinnamon extract is formulated to concentrate all of cinnamon’s health-giving benefits. The extract has been studied by researchers from the USDA and found to be helpful in supporting normal, healthy glucose levels. 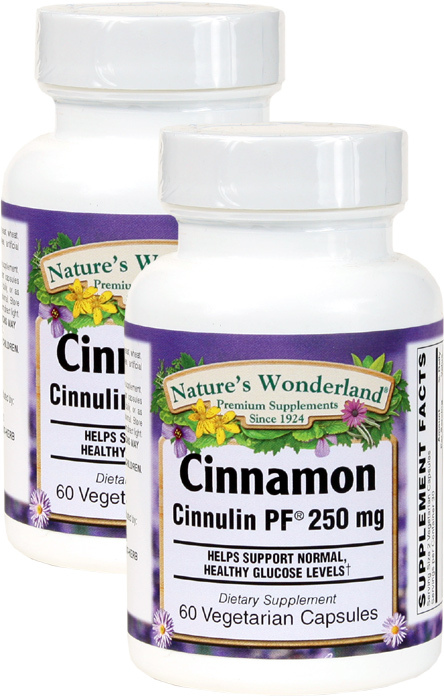 Helps support normal, healthy glucose level; supports body composition, blood pressure and antioxidant function in healthy individuals. As a dietary supplement, adults take 2 vegetarian capsules before a meal two times daily, or as directed by a health care professional.